Then I had to check myself. I shouldn’t have had that reaction in response to his innocent, excited post. Some of us singles have the tendency to think that way, though. If our steps are ordered, then I can only assume (since I don’t know the details of his relationship) that they are doing what’s right for them. Maybe he’s not the same person I remember from high school (high school WAS a long time ago…). I don’t know the ins and outs of their relationship AT ALL….so I can’t throw shade on their happiness. I don’t even know if their relationship is something that I would even want. Also, if steps are ordered, I can only assume that my single steps have a purpose right now. 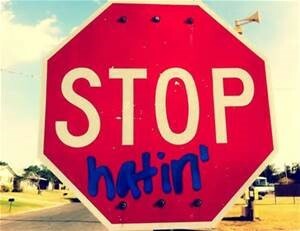 The bottom line is: DON’T HATE WHILE YOU WAIT! Unless there are obvious signs of something seriously wrong, then be happy for them, ESPECIALLY if you don’t know the details. I am always an advocate for being happily single versus being unhappily coupled, so I had to forgive myself for having that reaction a few days ago. Although it does get difficult sometimes, I’ve always looked at my single status as a time to grow and I have absolutely enjoyed my freedom. I’ve had opportunities that I may not have had the chance to take advantage of had I been in a relationship at the time. I’ve had the time to focus on my degrees, my job, and friends, family and travel. Being single has its perks…just don’t be bitter while discovering what those perks are! Take the time to do the things you’ve always wanted to do…learn a new language, try that new career path, take a road trip, spend more time with your children if you have them. Just don’t be sad about your singleness, and don’t question yourself if others around you are moving forward with their relationships. They are on their journey and you are on yours. And when I post my future engagement moment on social media (and trust me… it WILL be posted!) I don’t want anyone to have the same reaction I had a few days ago. And in the meantime, I’m going to go back and click “Like” on my schoolmate’s engagement post. And I know that I’ll mean it.